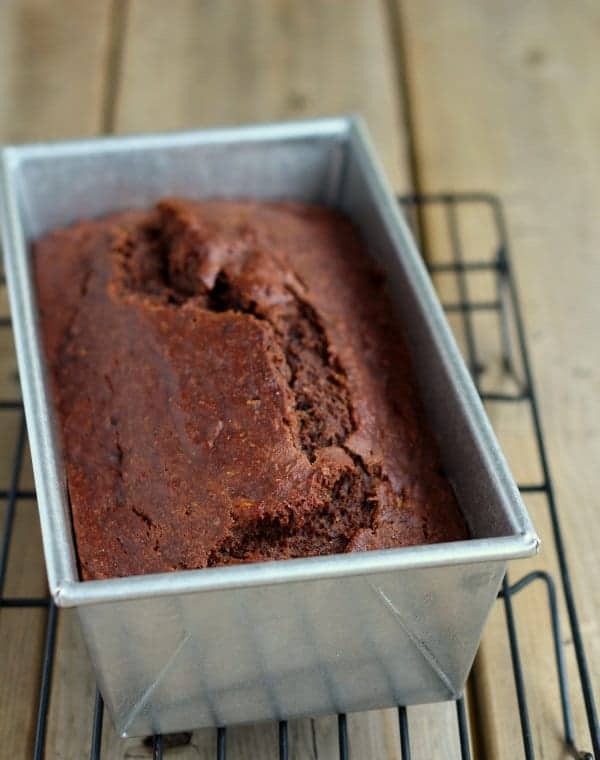 This whole wheat reduced-fat chocolate banana bread is (almost) guilt-free and is a perfect way to start your morning. Tastes great with coffee! 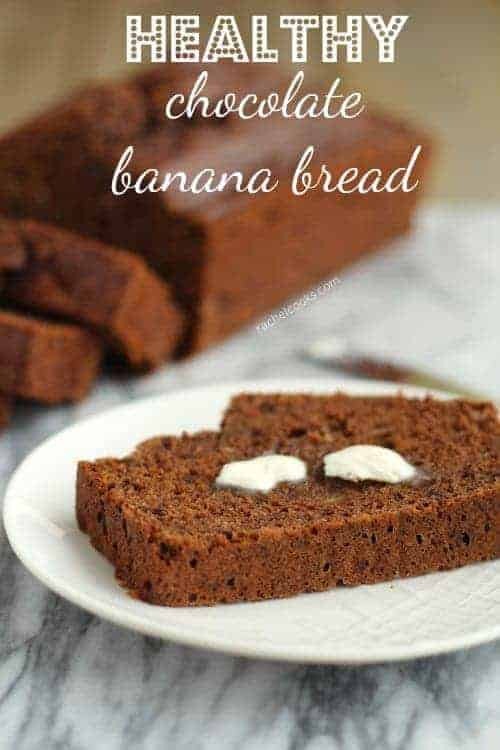 Banana bread is a classic, isn’t it? It is everyone’s go-to recipe when they have a pile of brown bananas siting on the counter top that no one wants to eat. We go through bananas like a bunch of monkeys, but occasionally a few are left over that have gone a little too far. It doesn’t happen often because I like them green and Ben likes them on the brown side, and we typically freeze some brown ones for smoothies. But we go through about 4 bunches of bananas a week so I’ll often buy even more to ensure that there will be some ready to turn into banana bread. I’ve been making this healthier version of banana bread for a long time (hence the less-than-pretty photos), but it is a family favorite. It is so super moist without hardly any oil. It freezes great and I often make two loaves so that I have one to pull out of the freezer when the first loaf has been eaten (in other words, in two days or less). Update: I wrote a new post about my whole wheat banana bread which is the way I make it now. I switched it up a little this time by adding some cocoa powder for some extra anti-oxidants. Yeah. For that reason. And for the great taste of cocoa. The best part is that it doesn’t add hardly any calories. I had to really fight the urge to throw in some chocolate chips as well to drive home the chocolate flavor but I wanted to keep this whole wheat reduced-fat chocolate banana bread as something I could feel good about eating at breakfast. PS: I’ve also made this base recipe into banana bread muffins and banana bread with coconut and chocolate chips! 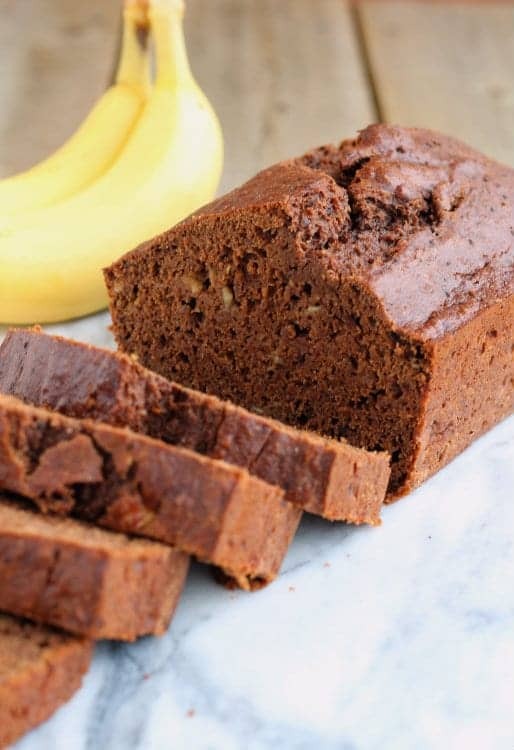 This chocolate banana bread is (almost) guilt-free and is a perfect way to start your morning. Tastes great with coffee! Preheat oven to 350 degrees Fahrenheit. Spray a 9- by 5-inch loaf pan with nonstick baking spray. 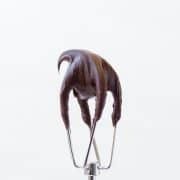 In a medium bowl, stir together flour, baking soda, baking powder, salt, flax seed, and cocoa powder until well combined. In a separate bowl, whisk together sugar, applesauce, oil, vanilla, and eggs until combined. Stir in banana to wet ingredients. Gradually stir in dry ingredients until everything is combined. Do not overmix. Pour into prepared loaf pan. Bake until toothpick or knife inserted into the middle of the loaf comes out almost clean, or about 1 hour. Let cool in pan for about 10 minutes before removing from pan and cooling on a wire rack. Cool completely before slicing and storing in an airtight container. Add a cup of chocolate chips if you want this to be a little more indulgent! Verdict: The whole family loves this bread! Changes I would make: mmmm….chocolate chips. Maybe next time. Just made them in muffin pan and they came out great. Since I wasn’t sure about the time I set the timer to 25mins but around 20mins I started to smell the chocolate and pulled them out. They were done but next time I will check them at 15-17 mins as I will definitely be making them again.They taste amazing, not overly sweet but I did cut the sugar back to just 1/2 cup to my preference. I can totally taste chocolate and banana. 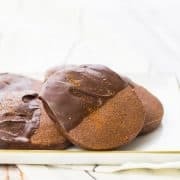 I love adding flaxseed meal to almost all my bakery goods and it was just the best addition to add to them. This is a guilty free, healthy, omega rich treat for my coffee in the morning. Thanks a lot for the recipe. Thanks for the comment Taran! Love the idea of making this into muffins. Glad you enjoyed them! 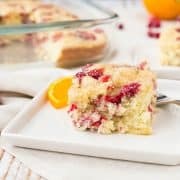 Would the measurement of the wheat flour be the same for white flour? 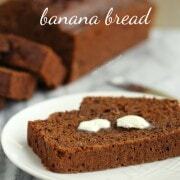 wonderful Chocolate Banana Bread,whole wheat banana bread!!! I’m so scared to make whole wheat/healthier recipes, but this looks really, reallllly good …. I may just have to try this! I’m not a big fan of healthy dishes and desserts, i think if you substituyes the fatness, the sweetness and the goodie part of the food whats left. but this banana bread looks so good and Chocolate with bananas are a classic combo. Wow, your family goes through a lot of bananas! I love that this is a chocolate banana bread, don’t see that too often. I don’t think I’d be able to resist adding in chocolate chips though! I’ve got a problem. Not yet-but I can tell! And it has chocolate too! I seriously love this bread and would like to have several slices. I like my banana a little on the green side too. I think it helps with the texture! This bread looks scrumptious!